Property 9: Kleio Home - Close to the beach! Property 25: Evita's Home, ideal for families & friends with breathtaking sea view! Property 29: You relax while we take care of you - Read our reviews and book now! Property 34: You relax while we take care of you - read our reviews and book now! 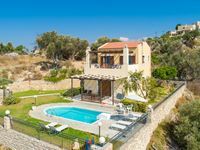 Property 37: Afroditi Villa, goddess Of Beauty And Pleasure In Cretan Nature! Property 38: Villa Vaggelio, Panoramic Views in Total Quietness, Close to the Beach & City! Property 40: Villa Dafni! Countryside views, walking distance to shops, close to the beach! Property 42: Villa Renta Eleni! Country views, private pool, 350 m2 lawn, close to beach! Property 48: Brand new villa with Private swimming pool close to the beach and the amenities.